The 33rd National Convention of the American Merchant Marine Veterans (AMMV) organization opened with early Registration on Wednesday, March 20th. The Registration team was led by Kimberly King with Lynn Kelly and Sindy Raymond assisting. The Hospitality Room was once again generously stocked with drinks and snacks. In addition, Shirley Knight provided a variety of Easter candies. Many other items and treats were featured. Special challenge coins to commemorate the 33rd Convention, in conjunction with the SS American Victory Salute to Service cruise, were provided to all WWII Vets and VIP’s. AMMV calendars were given to all paid registrants, and promotional drink cups to support the WWII Merchant Mariner Congressional Gold Medal Act (H.R. 550 & S. 133) were available for all. Form letters in support of H.R. 550, addressed to the committee holding the bill, were signed by all hands. All attendees received a “goodie bag”. Through no fault of our own, the shipment of the Commemorative Magazines was not received in time. Copies were later mailed to all attendees and paid advertisers. One notable surprise was courtesy of AMMV member Thomas Glenn Hill, who provided color posters of vessels for each of our WWII Merchant Mariner attendees. These were individually presented by Sheila Sova, who had done the research to pair mariners with their respective vessels. Hill’s late father served in the WWII Merchant Marine. The annual Board of Directors meeting was held on Thursday morning. Topics discussed included our 501 (c) nonprofit status; membership concerns; timeline and importance our C/MSRB Veteran status application for Korean Conflict U.S. Merchant Mariners; location of the 2020 AMMV convention; and financials. The proposed budget was approved after being amended to include $4,000 for advertising in the quarterly Kings Point (USMMA) alumni magazine. Opening Ceremonies commenced after lunch, which included a prayer by AMMV Chaplain & Regional VP Bob Ross, and the performance of Star-Spangled Banner and Heave Ho by Sally Langwah. Capt. Christopher Edyvean followed with a President’s Report. Key topics included membership concerns; social media & website report; the need for more key volunteers; and WWII Merchant Mariner legislation. Father Sinclair Oubre from the Apostleship of the Sea – USA provided a progress update on efforts to see Brother Marinus (Capt. LaRue of SS Meredith Victory) elevated to the level of Sainthood. Later that evening, approximately 70 convention guests enjoyed a dinner cruise on the yacht Starship II in Tampa harbor. Convention Chairman Capt. Dru DiMattia arranged for big band era music to be played in the background. After dinner, Sally Langwah sang Happy Birthday to AMMV Executive Vice President Christian Yuhas. Following a coffee break, Past-National President Morris Harvey was surprised with a Board of Directors proclamation bestowing upon him the title of President Emeritus. A framed certificate and a special ballcap (provided by Bob Ross) were presented to Morris. Toni Horodysky, creator of the usmm.org website, took the podium next and talked about her website. She highlighted some interesting historical finds while performing research. After lunch break, AMMV Webmaster Bonnie Dye joined the group to discuss ammv.us. She answered various questions related to the website. Christian Yuhas introduced three Resolutions which originated from the Golden Gate Chapter. After some minor tweaks, each of these Resolutions was approved by the membership. 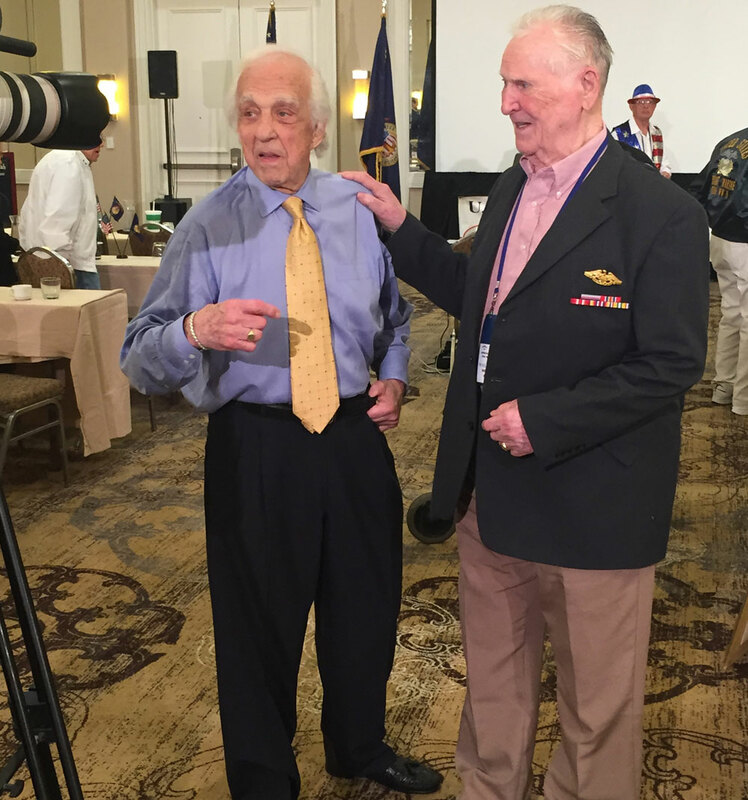 NOAA representatives David Alberg and Tane Casserley played a short DVD of which included footage from interviews conducted with our WWII Merchant Mariners at the 2018 National Convention. This film is part of ongoing efforts toward east coast sanctuary expansion. Later that evening, the Patriotic Dinner opened with the Sea Scouts Ship 106 presenting the Colors. The Pledge of Allegiance was recited, then Sally Langwah sang Heave Ho. Following the serving of the dinner, gCaptain Founder Capt. John Konrad delivered an emotional speech which is on par with AMMV’s goals and vision for the future. The AMMV Awards Ceremony followed. Recipients were as follows (not all in attendance): “Member Appreciation” plaques: Scarlett Rose, Christian Yuhas, Capt. Scott Nowak, Stanley Blumenthal, Clearance Newcomer, Charles Mills, and E. Douglass Pushard; “Outstanding Volunteer” plaques: Sindy Raymond, John Pitts, Laura Johnson Riddle, Janet Wilzbach, Michael Helbig, Lynn Kelly, Sheila Sova, and Dave Yoho. Capt. Chris also presented Mr. Yoho with a copy of A Careless Word, A Needless Sinking. Top tier award winners (Harvey-Wichita Award) were Capt. Dru DiMattia (AMMV Person of the Year), and Toni Horodysky (Lifetime Achievement). Finally, John Pitts surprised Capt. Chris with a Chelsea clock on behalf of the AMMV membership as appreciation for four years of organizational leadership. Next, the 50/50 raffle was drawn ($242 prize) with winner being Sandra Barth. Several consolation prizes were raffled off, including items provided by the Gary Sinise Foundation. Dave Yoho followed with encouraging closing remarks and presented a large donation to the organization. Entertainer Tomaczek Bednarek performed God Bless America. Sally & Roy then took the stage for a spectacular performance. On Saturday morning, our group was bussed to the Florida Aquarium for a breakfast with guest speaker 3-time Emmy Award winner, famed TV news reporter, and Veterans advocate Rita Cosby. This event was held in the Mosaic Room, which overlooks the bow of the SS American Victory, creating a beautiful setting for the morning. U.S. Maritime Administrator Admiral Mark H. Buzby joined us and provided opening remarks. Rita told the story of her father’s experience as a Polish resistance fighter, who was taken as a POW and later rescued by U.S. troops. After her presentation, Rita declared to support legislative efforts for our WWII Merchant Mariners. She kindly allowed time for photo ops with our Veterans. Our 33rd convention concluded with our gang being part of the SS American Victory Salute to Service cruise, which was attended by approximately 650 persons. The cruise included lunch by Mission BBQ and live entertainment. The weather was absolutely perfect for the day’s activities. During the cruise, Rita Cosby interviewed a couple of our Veterans, and later announced and identified each of our Vets by name over the PA system. This was a wonderful way to let the cruise participants be aware of our WWII MM Veterans. Footage of the cruise later appeared on local TV stations. Early discussions indicate a return to MITAGS (Baltimore) for a 2020 convention. See you there! WWII Merchant Marine Veteran Walter Broll will be attending the 33rd AMMV National Convention in Tampa on March 21st thru 23rd, 2019. Broll is a survivor of the December 2nd, 1943 air raids at Bari, Italy. Over 100 German aircraft attacked Bari Harbor, damaging or sinking a total of about forty Allied vessels of significant tonnage. These numbers include seven American Liberty ships, of which Broll was serving on the SS Grace Abbott, one of the damaged vessels. This event became unofficially known as the “Second Pearl Harbor” due to the destruction caused by the enemy. The American ship John Harvey was carrying a top-secret cargo of mustard gas and, upon its destruction by the enemy, leaked the toxin in large quantities. Soon, hundreds in the area became ill.
Mr. Broll will be attending his third AMMV National Convention in the past four years. He is one of a handful of WWII Merchant Mariners who has his audio biography available in the U.S. Merchant Marine (Ralph E. Crump) gallery of the National WWII Museum in New Orleans. Click HERE to read an archived AMMV News article about his experiences at Bari. The American Merchant Marine Veterans National Convention Committee welcomes WWII Merchant Mariner Oliver Lua to our Tampa event in March; he just recently joined the AMMV. Oliver was only 15 years old when he boarded his first vessel, Liberty Ship William S. Ladd, in San Francisco Harbor. Several months later, Lau would experience intense action while the Ladd was anchored in Leyte Gulf in the Philippines. The only other merchant ship to be sunk in the Leyte operation was William S. Ladd. Before she went down in Leyte Gulf she established the proud record of four planes destroyed. She accounted for one plane on the afternoon of December 5 and knocked down three on December 10. One of these planes crashed into her and set 500 drums of gasoline afire. A number of explosions in No. 4 and No. 5 holds followed at 1830 and the ship began to settle by the stern. At 1750 the after guns had been secured and the men manning them were ordered to abandon ship. At 1840 guns No. 1 to 5 were ordered secured and the Armed Guards were ordered to abandon ship. Not until 1930 did the last Navy personnel and ship’s officers abandon the doomed vessel. Eight Armed Guards were wounded when the plane crashed into Ladd (Naval History and Heritage Command, 2014). Oliver and his wife Anne will be traveling to Tampa all the way from Washington State to participate in AMMV’s 33rd National Convention. 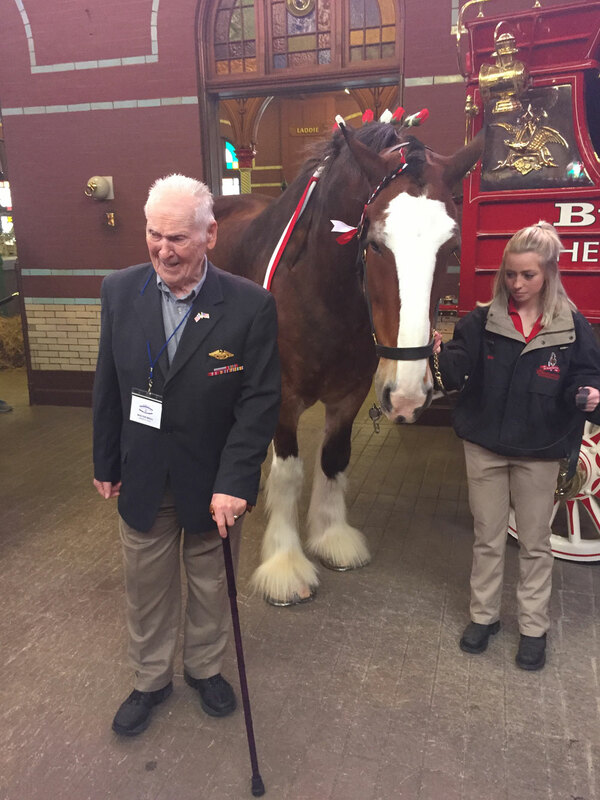 We look forward to hearing his WWII stories, and we thank him for his service to our country! CONFIRMED for AMMV’s 33rd National Convention in Tampa is 3-Time Emmy Award Winner, Best-Selling author, Famed TV Host, News Reporter, and Veterans advocate RITA COSBY. During her remarkable career, Rita Cosby has hosted primetime televised programs on FOX and MSNBC. She has interviewed dozens of world leaders and major celebrities. Rita will be joining us for the Patriotic Dinner on March 22nd at the Westshore Grand. The next morning, we are honored to have her deliver our Keynote Speech following a breakfast at the Mosaic Center in The Florida Aquarium. 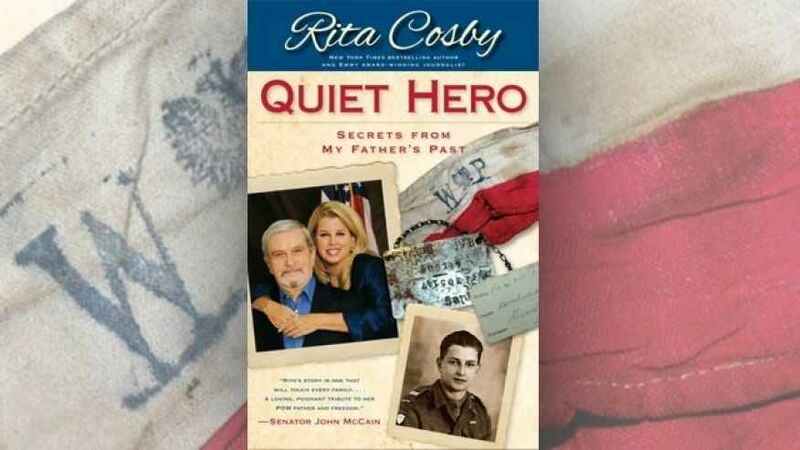 She will be presenting on her best-selling book, Quiet Hero, which begins with the discovery of her own father’s WWII service as an underage Polish résistance fighter, who became a POW, saved by US Troops. This story is an amazing slice of history and recommended reading for all who admire the Greatest Generation. A book signing will immediately follow her special presentation. Members of Congress have reintroduced pieces of legislation which would recognize those who served in the WWII Merchant Marine. Rep. Al Green (TX) reintroduced H.R. 154 (same bill number as in the 115th Congress) which would, if enacted, provide a one-time payment of $25,000 to eligible WWII Merchant Mariners. As with the last several sessions of Congress, this “compensation” bill lacks a Senate sponsor. However, Rep. Green was able to kickstart the legislation by adding a quick 17 co-sponsors. The WWII Merchant Mariner Congressional Gold Medal Act has also been reintroduced by repeat sponsors Rep. John Garamendi (CA) and Senator Lisa Murkowski (AK). The new bills (H.R. 550 and S. 133 respectively), if enacted, would award a Congressional Gold Medal collectively to the United States Merchant Mariners of World War II in recognition of their dedicated and vital service during World War II. The final sponsorship tallies in the 115th Congress for the WWII Merchant Mariner Gold Medal legislation were 222 co-sponsors for the House bill (H.R. 5879) and 30 for the Senate bill (2127). Back in the 114th Congress, identical legislation passed the House but failed in the Senate. The Transportation Institute has created an application which sends a quick pre-written email to one’s representatives based on inputted zip code. CLICK HERE to engage Congress with an email requesting support of the WWII Merchant Mariner Congressional Gold Medal Act. Advocates are making a last-minute push to honor surviving Merchant Mariners of World War II. Click Here to see video/news feature.